Stephen Gary "Woz" Wozniak (born August 11, 1950 in San Jose, California) is an American computer engineer, a legendary person in the world of computers. And the main reason for this remarkable recognition is the computer Apple II (often written as Apple ][). By the end of its production in 1993, somewhere between five and six million Apple II series computers (including approximately 1.25 million Apple IIGS models) had been produced. In the beginning of 1970s, one of Wozniak's friends—Steve Jobs, had the idea to sell the computer as a fully assembled PC board. Wozniak, at first skeptical, was later convinced by Jobs to try the venture. Together they sold some of their possessions (such as Wozniak's HP scientific calculator and Jobs' Volkswagen van), raised $1300, and assembled the first prototypes in Jobs' bedroom and later (when there was no space left) in Jobs' garage. On April Fool's Day of 1976, Jobs and Wozniak formed Apple Computer Inc. (Jobs came up with the name Apple, because he had once worked in an apple orchard when he had experimented with vegetarianism in India). Wozniak still remains at HP, but he will leave in several months and will became the vice president in charge of research and development at Apple. Actually Woz was the computer guru, Jobs—the design and business genius. Their first product, the Apple I computer, was similar to the Altair 8800, the first commercially available personal computer, except it had no provision for internal expansion cards. With the addition of these cards, the Altair could be attached to a computer terminal and could be programmed in BASIC. The Apple I was purely a hobbyist machine, with a $25 MOS Technology 6502 microprocessor running at 1 MHz, on a single-circuit board with 256 bytes of ROM, 4K or 8K bytes of RAM and a 40 character by 24 row display controller. It lacked a case, power supply, keyboard, or display, which had to be provided by the user. The Apple I was priced at $666.66. Jobs and Wozniak sold their first 100 Apple I computers to a new computer shop, called the Byte Shop, in Mountain View, California. The owner bought just the circuit board for the Apple I, but he had to supply the keyboard, monitor, transformer, and even the case in which to put the computer. In August, 1976, Wozniak begins work on the Apple II. In December, 1976, Woz and Randy Wigginton demonstrate the first prototype Apple II at a Homebrew Computer Club meeting. In March 1977 Apple Computer moves from Jobs' garage to an office in Cupertino. In April Apple Computer delivers its first Apple II system (see the lower image), for $1295 (with 4K RAM). The CPU was MOS 6502, working at 1.0 MHz. RAM was from 4K min, up to 48K max. Display supported 2 modes: 280X192 graphics and 40X24 text, 6 colors maximum. I/O ports were composite video output and cassette interface. There were 8 internal expansion slots. An external 143K floppy was offered in 1978. The original Apple II operating system was only the built-in BASIC interpreter (written by Woz) contained in ROM. Most commercial Apple II software on disk, e.g. educational games and productivity programs, booted directly on the hardware and either had no operating system or incorporated one of its own (which was usually invisible to the user.) The Apple DOS Disk Operating System was added later to support the diskette drive (see the Apple II Reference Manual). Apple I appears to be a market failure, in May 1977, 10 months after its introduction, only 175 Apple I kits have been sold. So Woz and Jobs focused on Apple II. And they won. In October, 1979, 2.5 years after the introduction of the Apple II, 50000 units have been sold, all rivals (as Sol-20) were smashed and this was only the beginning of the story. In 1982 was reported that sales of all Apple II systems to date were 750000. 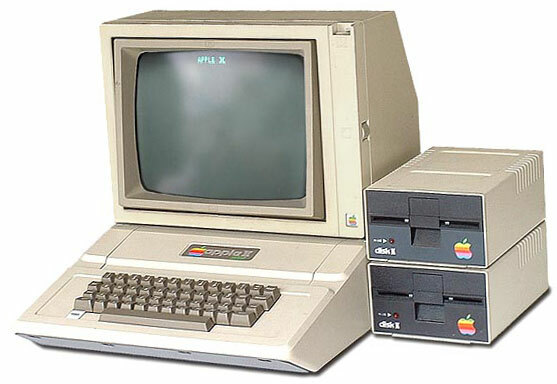 The remarkable Apple II became one of the most successful and recognizable computers for over 15 years—from 1978, during the 1980s and early 1990s. It was aggressively marketed through volume discounts and manufacturing arrangements to educational institutions, which resulted in it being the first computer in widespread use in American colleges and secondary schools. A focused effort to develop educational and business software for the Apple II, including the 1979 release of the popular VisiCalc spreadsheet, made the computer especially popular with business users and families.